One Ohio mom got a very special present for Mother's Day, when her identical twin girls were born holding hands. Sarah Thistlewaite's daughters, Jenna and Jillian, are a rare set of monoamniotic or "mono mono" identical twins, which means they shared an amniotic sack and were in constant contact during the pregnancy. The condition also meant that Thistlewaite had to remain on bed rest for weeks at Akron General Medical Center in Akron, Ohio. The twins had to be constantly monitored for nearly two months, since mono mono twins can easily become entangled in each other's umbilical cords. "It's really mentally challenging. It's a very tough experience to go through," Thistlewaite told ABC News. 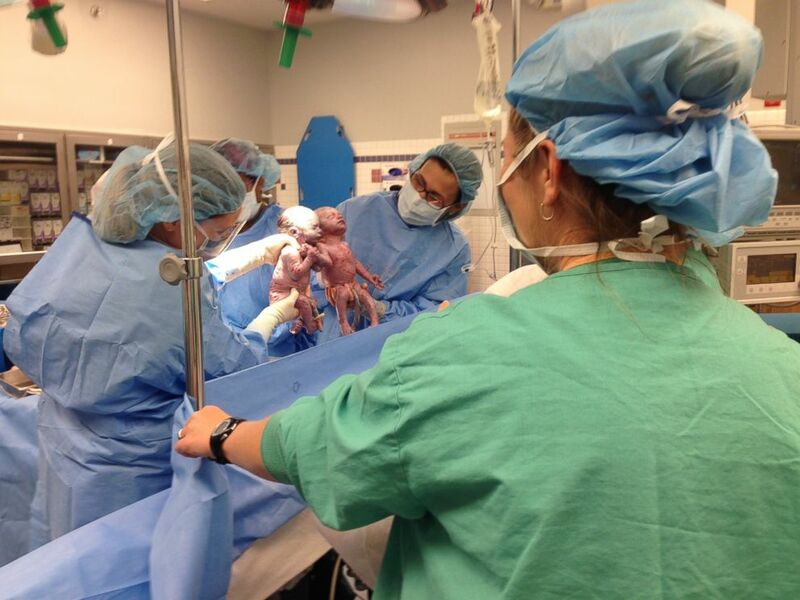 A pair of "mono mono" twins held hands after being born. Thistlewaite, who also has a 15-month-old son, had to check into the hospital for nearly two months so doctors could carefully monitor the babies. "They hook you up to heart rate monitors to watch for heart deceleration or variables," Thistlewaite said. "That's what they look for the whole time. I got ultrasounds every other week." Thankfully for Thistlewaite and her husband Bill, their daughters were born healthy at 33 weeks this past Friday. Doctors planned a Caesarian section because if the twins grew too large, they would be at greater risk for entanglement. As the girls were born, doctors held them up over a sheet so that Thistlewaite and her husband could see them. The newborns were holding hands. "I didn't think they would come out and instantly holding hands. It was overwhelming. I can't even put into words," Thistlewaite said. "There wasn't a dry eye in the whole OR." Although the girls were born healthy, Thistlewaite said Saturday they had some breathing problems, so they were moved to the neonatal unit at Akron Children's Hospital. Today Thistlewaite will get to celebrate Mother's Day by introducing her daughters to their older brother for the first time. "It's the first time that we'll all be together in one room," Thistlewaite said.